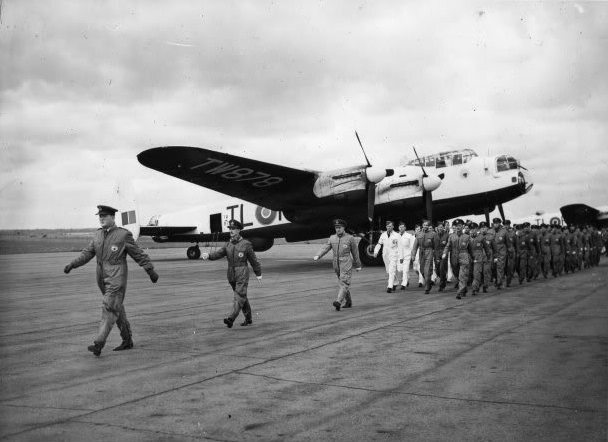 The famous No 35 Squadron – 16 RAF Lancasters – which has travelled 15,000 miles on a Goodwill Tour of North America, was taking off from New York, where the Tour started on 17th July 1946 for its Return Home this afternoon (22nd August 1946). The Bombers are due at St Mawgan, Cornwall on Monday. Reuter. Departure began with A-Flight leaving Gander for Lagens Field, Azores on 24th August and after an overnight stay then arriving St Mawgans on 25th August. On 29th August they departed RAF St Mawgans to RAF Graveley Via Flyovers of Plymouth, Torquay and London. The Officer Commanding B Flight Signalled St Mawgan from Lagens that they intended to leave on the 26th August (am) leaving ahead of schedule because of better weather conditions and that he had received no further advice regarding Lancaster TL-R involved in the incident at Gander. Also on the 25th August, ‘B’ Flight took off from Gander for the trip to Lagens. The squadron departed at night (TL_Q took off at 23.35 hrs) and unfortunately, there was an incident that involved Fatalities. TL-R (TW870), piloted by F/L Pete Stockwell, had to return to Gander after 20 minutes in the Air as he had problems with his DR compass. He was cleared to Land but mistook 2 directional Green Lights which marked the leeward end of the Runway for Glide Path Indicators. As a result, the Aircraft bounced on the raised Road which was parallel to and 20 yards from the Leeward end of the Runway. It was also marked with Red Lights as a Prohibited Area but there were some observing Civilians standing there. The Aircraft’s starboard wheel hit some of them, killing 3 men & 1 woman & injuring a 4th man. The Lancaster was damaged and had to remain at Gander. On investigation, Stockwell was exonerated of all blame (source mostly Alan Cooper). – (See separate page-link above). 35 Squadron A Flight departed Lagens on the 25th August, but probably they left late at night so arriving St Mawgan early the next morning, the 26th. Likewise, B-Flight probably arrived in the early hours of the 27th. The whole 15 Aircraft left then departed St Mawgan on the 29th August. The Officer Commanding B-Flight Signalled St Mawgan from Lagens that they intended to leave on the 26th August (am) and leaving ahead of Schedule because of better Weather conditions. Also that he had received no further advice regarding Lancaster TL-R involved in the incident at Gander. The Squadron spent 3 days at St Mawgan on their Return where no doubt the HM Customs took a keen Interest in the Aircraft. On the 29th August the remaining 15 Lancasters departed St Mawgan for Graveley, under Signalled Instructions from 3 Group to Fly in Formation following a Coastal Route of Holiday Resorts including Plymouth, Torquay, Bournemouth, Bognor, Worthing & Brighton before turning North for a Flypast across London to a warm Reception at their Home Base – Graveley. The Formation Fly-over on Camera. Several Formation Shots. Lancaster Bombers come in to land, touching down, taxi across the Aerodrome, to the appointed position. General Views of Planes lined up with Crew standing in front of same. Wing Commander Craig greeted by Air Marshal Sir Norman Bottomley. Close Ups – Group Captain R C M Collard talks to Camera about Trip, he thanks Crews and the Reception Committee for their welcome. Those VIP’s present included ASA Ambassador Representative Mr Corville, Lord (William) Henderson of Westgate – Air Council and Sir William Brown. Group Captain R C M Collard, (his Boss & Privately Educated), was a bit of a ‘Wet Fish’ and W/C A J L Craig used his Charm & Brain to get on well with him. Such was the ‘Class System‘ within the Ranks. Fellow Crew members said that they could not understand why Alan came out of the RAF since in their estimation ‘if anyone was headed for the top it was him‘. Peacetime wasn’t when Men of his ilk shone through if pinned down by other Bureaucrats. Alan carried on Piloting Gloucester Meteors, Handley Page Victors & Valiants. W/C Craig leads the Marching on for Inspection by the American Ambassador at Graveley, August 29th 1946. IWM Film 3: Wide Shot over Airfield from Air Traffic Control Tower with Airfield Code “GR” in Foreground (Graveley), Parade being carried out on edge of Taxiway, Squadron Disposal Board for 35 Sqdn, Crews marching past, 35 Squadron HQ building Sign, Lancs Taxiing out, Shot from onboard Aircraft & take off. Flying over Coastal Town. VIP’s present included ASA Ambassador Representative Mr Corville, Lord (William) Henderson of Westgate – Air Council and Sir William Brown. Bottomley prepares for a Welcome Speech (extreme left) and Dignitaries look on – American Ambassador (William Averell Harriman? ), RAF Officers, USAAF Officer & Grp Capt Collard. The question of much earned Leave after the Goodwill Tour was to be decided by the C in C against the backdrop of important forthcoming Commitments for the Squadron which they had to fulfil in connection with the Battle of Britain Aniversary and an RAF Recruiting Campaign. No doubt the C in C considered their 6 weeks gruelling US Oddysey to be something of a Picnic. Anniversary Postcard signed by Ray Leaf?? Graveley is misspelt and RAF Scampton added hence the Lincoln Lancaster Committee instead of Graveley, Cambridgeshire.